Aurora Expeditions' are proud to announce that their resident Polar Photography Guide, Joshua Holko, has been awarded the 2014 Victorian Australian Institute of Professional Photography (AIPP) EPSON 'Photographer of the Year' for his stunning photograph taken in Antarctica during his November 2013 expedition on board the company's small expedition vessel, Polar Pioneer. With an image featuring Aurora Expeditions' small expedition ship, Polar Pioneer, and a vast tabular iceberg, Joshua, a Moab Master and full-time professional landscape, nature and wilderness photographer and teacher, also won the award's 'Science, Environment and Nature Photographer of the Year' and 'Creative Award of the Year'. “It's a great honour to have been named the 2014 Victorian AIPP EPSON 'Photographer of the Year'. My love and passion for photography is only heightened by the fact that I get to team my profession with visiting some of the most amazing places on earth. Antarctica is truly one of the most photogenic places I have ever visited.” says Joshua. Joshua will be joining Aurora Expeditions 'Spirit of Antarctica' expedition in December this year and is inviting budding photographers to join him on board to discover the art of professional photography. The 12-day voyage will allow passengers to spend time honing their photography skills amongst the ice and wildlife of Antarctica alongside one of Australia's most inspiring photographers. Delivering Canon and AIPP-accredited workshops, Joshua will run an exclusive and complimentary on board photography program that is open to all levels of photographer. The program also includes informal talks and image reviews, opportunities for one-on-one instruction and informal side-by-side shooting from the deck, in Zodiacs and during shore landings. The expedition aboard small ship Polar Pioneer, accommodates just 54 passengers plus a team of Expedition Experts including naturalists and historians. The small ship experience ensures passengers enjoy the highest staff: passenger ratio and have the opportunity to truly maximise photographic opportunities. Polar Pioneer is supported by a fleet of Zodiacs and crew allowing all photographers to be shooting simultaneously with plenty of room to spare for camera equipment. The 'Spirit of Antarctica' voyage featuring complimentary photography workshops with award-winning photographer, Joshua Holko, departs 6 to 17 December 2014 from Ushuaia in Argentina. The expedition price starts from US$8,700 per person, triple share and includes a complimentary waterproof polar jacket and hardback voyage journal, plus all accommodation, meals, shore excursions, guiding services, landing fees and photography program. 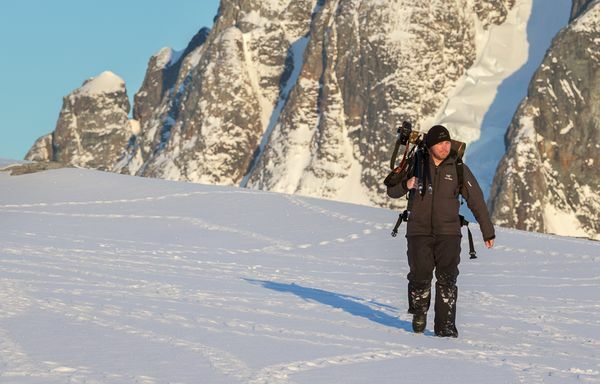 Join Joshua on this exciting Antarctic adventure and hone your photography skills in the most beautiful place on Earth. For more information visit www.auroraexpeditions.com.au or freecall (Australia only) 1800 637 688 or +61 2 9252 1033 to speak to an Expedition Expert. This 12-day voyage allows passengers to spend time capturing the ice and wildlife of Antarctica alongside one of Australia's most recognised photography experts. Departing Ushuaia and finishing in Punta Arenas, Chile, the route includes special access into areas normally restricted to scientific research, and exploration of spectacular locations such as the breathtaking Lemaire Channel, the Gerlache Strait and the surreal geothermal Deception Island, to name but a few. Photographers can expect to see plentiful wildlife including various species of penguins, whales, and seals. For more details on this voyage, please click here.